Robust innovation in the United States is key to a strong and competitive industry and workforce. Efforts to improve the capacity of individuals and organizations to innovate must be a high national priority to ensure that the United States remains a leader in the global economy. How is the United States preparing its students and workers to innovate and excel? What skills and attributes need to be nurtured? The aim of the Educate to Innovate project is to expand and improve the innovative capacity of individuals and organizations by identifying critical skills, attributes, and best practices - indeed, cultures - for nurturing them. The project findings will enable educators in industry and at all levels of academia to cultivate the next generation of American innovators and thus ensure that the U.S. workforce remains highly competitive in the face of rapid technological changes. Educate to Innovate summarizes the keynote and plenary presentations from a workshop convened in October 2013. The workshop brought together innovators and leaders from various fields to share insights on innovation and its education. 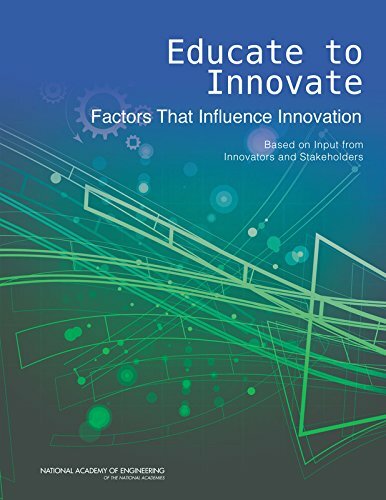 This report continues on to describe the specific skills, experiences, and environments that contribute to the success of innovators, and suggests next steps based on discussion from the workshop. About: Robust innovation in the United States is key to a strong and competitive industry and workforce.